When the Germans invaded Belgium, Arthur Schrynemakers told his wife, who was French, and their three children, a son and two daughters, who were born in England, to flee to England. The son, also known as Arthur, joined the British Army. He dropped the name Schrynemakers and went by his middle name of Britton. He was first assigned to guard duty at Windsor Castle. He appears in the following photo on the left. But when it became known that he spoke German, Dutch, and French as well as English, Arthur Britton was assigned to Field Security. His next assignment was to Tunisia, where he is shown in the photo below on his motorcycle in Tunisia. Note the 45 F.S.P. identification on the wall of the building. Shortly after D-Day, Sgt. Britton and his men arrived in France. They were the first British troops in Lille and were mobbed by the happy Frenchmen, as you can see the photo below. He and his men were hoisted up and carried on the shoulders of the crowd to the best hotel. Next stop was Brussels. There he was given a brief leave so that he could see his father, with whom he had had no contact for four and a half years. It was only then that he learned that his mother had died during the war. Britton is shown below with his father, Arthur Schrynemakers, and two other British soldiers in front of Schrynemakers’ home. Note the celebratory flags on the front of the buildings. After that came the Belgian Ardenne where he was responsible for checking the identity of American soldiers to make sure they were not Germans attempting to infiltrate the American lines. He is shown below at the far left in the Ardenne in December 1944. Thanks to the research of Jean-Marie Schrynemakers, the woman in the photo has been identified as Josephine Fivet, known as Fina, born in Yvoir, Belgium, Feb. 10, 1924. A very brief interview of Arthur Britton filmed by British Movietone is to be found at https://www.youtube.com/watch?v=RBfs_SYreIs on YouTube. A more detailed interview of Britton was done by Belgian RTBF television in September 2002. The title is “Le Coup de Filet d’ Arthur Britton Arrestation d’ Himmler,” and is in French. A copy with English language subtitles, posted September 4, 2018, is available on YouTube at: https://www.youtube.com/watch?v=uVZU-1Bv-6M&list=PLfO3-TNAQN-paJ3iZVjxoYVJtJ0yUlAQ_. In case of difficulty accessing the video with English subtitles on YouTube, try clicking here for a version of the video stored on DropBox. There is a momentary delay before the video begins playing. During interrogation by the British officers, Hitzinger/Hizinger finally admitted to his identity: “I am Heinrich Himmler.” Shortly thereafter, he committed suicide, using a cyanide capsule hidden in his mouth. There are a good many accounts of Himmler’s arrest and demise. One particularly thorough article appeared as “Himmler’s Suicide” in the magazine After the Battle, issue no. 14, 1976. Another source, Nick van der Bijl’s new book, Sharing the Secret, The History of the Intelligence Corps 1940-2010, Pen and Sword, 2013, provides further information on Britton’s role (see pp. 166-167). Two newspaper accounts of Britton’s arrest of Himmler appear below. The first was published in the Flemish newspaper, Het Laatste Nieuws, 1946, with the English translation following. Sergeant Britton Schrijnemakers, of Dutch descent and a member of the British Intelligence Service, came ashore in Algiers in 1943, took part in the campaign in Tunis, crossed over to Sicily, was recalled to England before the invasion and came ashore in Normandy on 9 June 1944. As part of the major breakthrough to the north, he was with the 30th British Army when via Brussels he crossed the Albert Canal and took part in the rush of British tanks to Eindhoven and to the heavily fought for city of Nijmegen. While heavy fighting was going on at the Nijmegen Bridge, sergeant Britton, with his intelligent unit, occupied the NSDAP building on the Oranjesingel, where the roof shingles still rattled while exited Germans on the other side of the Waal in vain tried to make contact with their already departed Nijmegen unit. After that came the massive breakthrough to the Reichwald, over the Rijn, Osnabruck, Bremen and finally to Bremervorde, the historical place where the executioner and hangman of occupied Europe, the head of the ten thousands of his brutes in the Sicherheitsdienst, whose terrible deeds could be seen all over the continent, was finally arrested himself, Heinrich Himmler, a Feldwebel, who a few days earlier had made an offer of peace. British headquarters were he identified himself and a few days later committed suicide. 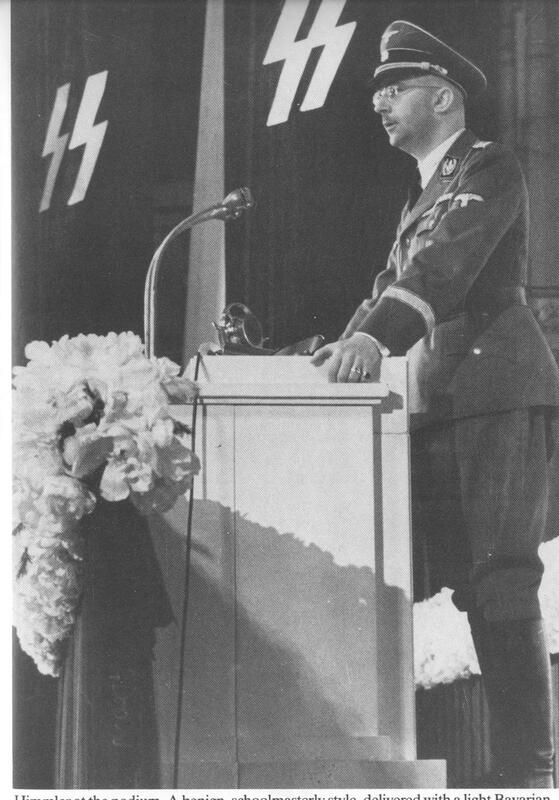 HIMMLER, A CALM AND MODEST MAN. What impression did Himmler make on you? He was the calmest most modest man that I had ever met ………(missing)……………. Another article appeared in the major Brussels newspaper, Le Soir, in 1970. An English language translation follows the scanned image of the article. My thanks to Jean-Marie Schrynemakers for providing the image. By a combination of clicking on the image and using whatever magnification feature your computer has, you should be able to make the article of a readable size. methodically cruelest accomplice to Hitler, committed suicide. and sinister world of the Third Reich. and studies the personality of the S.S. Reichsfuhrer. solve the enigma of his behavior. meddlesome and cruel personality, to name a few of his vices. to believe that Himmler would be devoted to a life free of misdeeds. However, he became the monster of Nazi monsters. He himself chose the bucolic study of agriculture. and physical courage, without intellectual vigor. most contemptible affectedness: incomprehensible, indescribable. aborted putsch on 9 November 1923.
of Rohm had barricaded themselves, carrying their flag. Fuhrer and became, in 1929, commandant of his personal guard, the S.S.
heartless person bereft [of] scruples that contemporary history has known. entourage of Admiral Doenitz until 5 May 1945.
surrender of Germany while saving himself. But Doenitz wanted none of it. 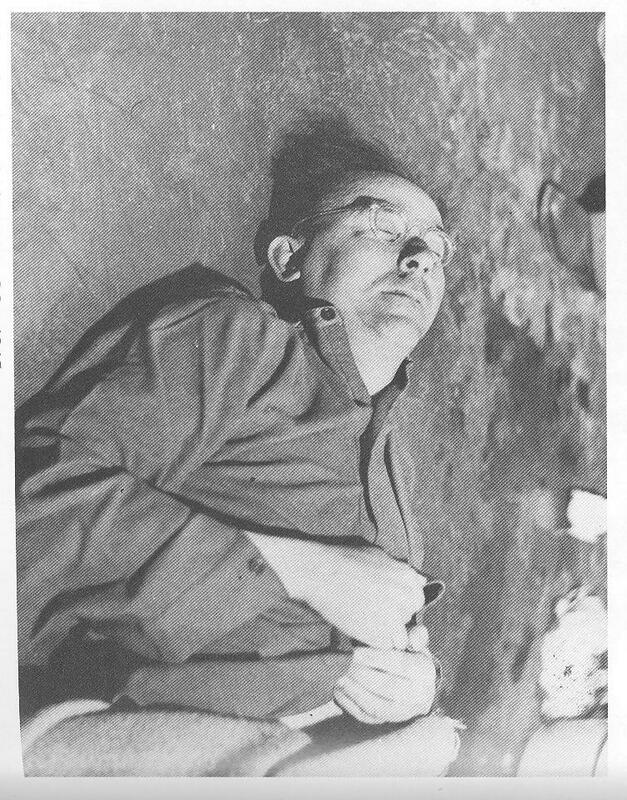 hunted by the allies, Himmler was narrow-minded, imagining to himself that at the moment of Nazi capitulation he could save his skin, thanks to the western allies. joining up with some Panzers who had returned home. region which was particularly inhospitable to him. that he might have been spotted a few days before while making contact with Count Bernadotte. Thanks to his disguise and to his false papers, he hoped to climb over the Bavarian mountains in order to remain hidden until the day when troubles, which, in his estimation, would make havoc in the new Germany, just as after the armistice of 1918, would permit him to resurface, to reintroduce himself, and to negotiate with his conquerors. determined to chasten the Germans responsible for war crimes, just as he underestimated the capabilities of the British security services as he traveled through the occupied zone. the Bremervorde bridge, the only bridge left intact between Bremen and Hamburg. The 1003 detachment of Montgomery’s Field Security Reserve Detachment was standing guard there. remained at a farm in the area. neither a great captain or a hero. contradicted each other. The interrogator decided to confront them. At that moment, Hizinger took off his eye patch and declared himself the S.S. Reichsfuhrer Heinrich Himmler. Nazis had been directed to carry them. him a thorough body search in order to locate the cyanide capsule that they had vainly looked for in Himmler’s clothing. At the moment in which the doctor, Captain Wells, ordered him to open his mouth, Himmler chewed the poison encased in his jaw. Despite the most energetic care possible, he died in twelve minutes. never be discovered by historians. and the doctor. He was ordered to bury Himmler in the utmost secrecy. No one will ever know where he is buried. Thus, Himmler may remain forever the most enigmatic character of the Third Reich. arrested Himmler at the Bremervorde bridge on 22 May 1945. I had the pleasure of making the acquaintance of a businessman who is dynamic, very friendly, smiling, and without vanity, and whose Belgian education at l’Institut Saint-Louis in Brussels as well as 43 years of living in Belgium have not erased his Britishness. eager to return to Great Britain to volunteer for the war. security service he served in Africa and the Tunisian campaign in 1942, as well as the landing in Sicily in 1943. Ardennes, reaching the Rhine in 1945.
impressions that Himmler left with him. papers rubber stamped by the Wehrmacht. than Himmler . . . and that’s all! that they had familiarized him with the arrogant behavior that German officers generally had toward their inferiors. Also, Mr. Britton thinks that they benefited from those naive S.S.
allowed to pass by them unnoticed. After that, there was a ceaseless effort to uncover the two escapees. them . . . at Bremervorde everyone was on the lookout! answered that it was certainly not because of his exterior personality. Himmler the man had nothing about him to draw attention. “. . . He looked like a vanquished German, just like all the others. finally, because of the counterfeit rubber stamp of the Wehrmacht. mandate: S. D. (Sicherheidsdienst: S.S. security service). identity and of the importance of his successful arrest. Himmler had hidden in order to find his baggage. sllippers. So for one day, the improbable happened and Britton became an old duffer padding about in his slippers. other. Visibly, Himmler does not haunt his memory. Intelligence Corps could not deliver him to his trial. colossal power ever seen in crime. Thus Himmler, whose career was death every day, will appear to future generations as mysterious as the hideous Nazi death that he created, mysterious and enigmatic, for all time, in all of Europe, enslaved in his bloody yoke. Himmler photographed during a visit to the Low Countries, early 1944. Sergeant Britton, 25 years ago, around the time of Himmler’s arrest. Mr. Britton, in his Brussels garden today, near the Soignes forest. Regarding the photo outside Schrynemakers’ home featuring four men, Arthur Britton, his father and two unknown soldiers; the soldier on the far right is my uncle Arthur Alan Smith (his is the first signature on the second page of the arrest report for Heinrich Hizinger, alias Himmler). I am collating an account of Himmler’s capture and would welcome any information that you have of your uncle’s involvement. Copies of documents and photos. Hello, excuse my school English. What contained Himmler’s bag hidden in the barn? In his YouTube interview, “The Arrest of Heinrich Himmler”, which is in French (see https://www.youtube.com/watch?v=6-C6I5_Gj_g&index=18&list=PLfO3-TNAQN-paJ3iZVjxoYVJtJ0yUlAQ_), Britton says that there was a small valise hidden at the farm house and that it contained a shirt, pajamas, bedroom slippers, and a toiletry case with an insignia that read “Reichsfuhrer SS”. Britton kept the slippers. I am former Intelligence Corps and am a trustee of the Military Intelligence Museum. We would be very interested in anything related to the capture of Himmler – photos and artefacts etc. The Int Corps were heavily involved in arresting alleged German, Italian and Japanese war criminals. Another in Germany was Rudolf Hoess, the Auschwitz commandant. A RAF pilot named Winkler Brown claims he interrogated Himmler. Is this correct? I am conducting a research project on Heinrich Himmler and I’m citing this article as a source. Could you please give me the name of the person who wrote this article? The article was written by Bruce Bolinger, who is the webmaster for the website as well as a cousin of Arthur Britton. Bolinger’s grandfather, Theodore, and Britton’s father, Arthur, were brothers. Bolinger met with Britton several times and corresponded with him extensively. Britton shared documents and photos with Bolinger. Delighted to hear from you as I am putting together an article for the October edition of Britain at War – at their request. I cannot find our email exchange and I wanted to include your father’s role.